Memorizing is Out in Syrian Schools? Poetry is In. “Memorizing school books by heart is no more the way to excellence with the new curricula,” says the Assistant Education Minster, Ali al-Hasri. This could be a very important change for Syria, if it can be implemented. When I attended the University of Damascus in the 1980s, exams for the English and History classes were based on memorizing the lectures. One Fulbright English professor from the US who taught a class of 600 students showed me his blue books for the final exam., the only grade in the course. All but 15 of the blue books were copied from his lectures, which had been taped, transcribed (badly), mimeographed and sold to students before the exam. The students memorized the lectures by heart rather than read the novels – Jane Austin, Dickens, etc., that were assigned. In response to questions that had little to do with his lectures, the students reproduced his lectures on the author word for word. Critical thinking emphasised in new school curriculum: Problem solving and decision making will replace memorisation, Assistant Education Minister Ali al-Hasri said. Raqqa, (SANA) – Memorizing school books by heart is no more the way to excellence with the new curricula. The measure is now the ability of learners to deal with problems, how to solve them and link them to real life situations, Assistant Education Minister Ali al-Hasri said. Inspecting the training courses on the new curricula in Raqqa province on Monday, al-Hasri told SANA that the Ministry of Education considers the new curricula as extremely important. The Ministry is training teachers to deal with these curricula which were based on modern educational and scientific methods. He pointed out that the new curricula will start based on a student-centered learning process as the focus is on the learner’s activities in and out of the classroom. This requires developing the learner’s skills in solving problems, taking decisions, shouldering the responsibility and teamwork, while the teacher is a guide for the learners. DAMASCUS, Syria — Lukman Derky, the host of a weekly poetry salon here, was in classic form, a beer perched below a microphone he used to joke, to soothe, to provoke. He read a short poem by Mahmoud Darwish, the Palestinian national bard, and gave a shout-out to a regular, a young American named Mitch, who sat in the crowd, among dozens of other foreigners. He also politely apologized to any secret policemen he might have offended with one of his stories. Two men who fit that description, sitting at a table by the bar, quietly sipped their drinks. So it goes on Monday nights at Bayt al-Qasid, or the House of Poetry, a space for freewheeling expression in a country where that space is usually in short supply. In sessions lubricated with local arak and Lebanese beer, Mr. Derky, a salon host with the bearing of Lenny Bruce, presides over an irreverent evening that the regulars say is impossible to find elsewhere in Syria, and indeed, would be hard to replicate anywhere else. Though Syrians are smitten with poetry and with their celebrated scribes, including Nizar Qabbani, Bayt al-Qasid provides one of the few platforms for young or undiscovered poets. The evenings here also draw writers from overseas, who listen as their work is translated from Spanish or Greek or Berber into Arabic on the spot. The performers who step up to Mr. Derky’s podium follow his lead and take risks, reading works by exiled poets or flirting with risky political subjects. But the point of the evening is not insubordination, Mr. Derky insists. “We don’t do things because they are forbidden,” he says. “The night is about freedom.” That may explain why it has survived for more than two years now, in full view of a government that has little stomach for dissent. It also explains why it is hard to find a seat. There were none available on an evening last month in the basement bar where, underneath posters of Malcolm X, Gandhi and Charlie Parker, American students huddled in groups, an entourage waited for one young Syrian poet and a couple snuggled in a corner. Mr. Derky dished out his typically eclectic monologue. He sang a Shiite mourning hymn and told a joke about the invasion of Iraq. He welcomed a British writer, Stephen Watts, who read a poem called “Birds of East London” that was translated simultaneously by a young Syrian poet who somehow managed to quickly interpret the line “when you see that kestrel pinioned on its wing-bone.” A bald Syrian read another poem, to muted applause. A Kurdish musical troupe brought the evening to a rousing close. “You don’t hear that music in public like this,” said Khalid Elekhetyar, a Syrian journalist and a regular who sat at one of the round red tables near the front. If the state was watching, it was apparently enjoying the show. “In this space, they don’t give any conditions,” he said. Mr. Derky, a frenetic Kurd with shoulder-length hair, has for years been a fixture of Syria’s creative class, a chain-smoking renaissance character who seems to delight in poking the establishment. He performs one-man shows and writes for television. He was homeless for a time, and now roams his neighborhood in Damascus every morning, looking for stories to fill a newspaper column. He is well known for a stint as the editor of a satirical weekly that enjoyed a brief heyday after President Bashar al-Assad took power 10 years ago. As Mr. Derky tells it, in 2001, when the publisher of the weekly, Al Doumari, first asked for his thoughts on the newspaper’s design, Mr. Derky asked him for a liter of arak, a bag of ice, pickles and hummus, and told the publisher to come back later that night to look at a mock-up. Eleven popular issues later, Mr. Derky left the magazine over differences with the publisher, and by 2003 the government had had enough and shut it down. 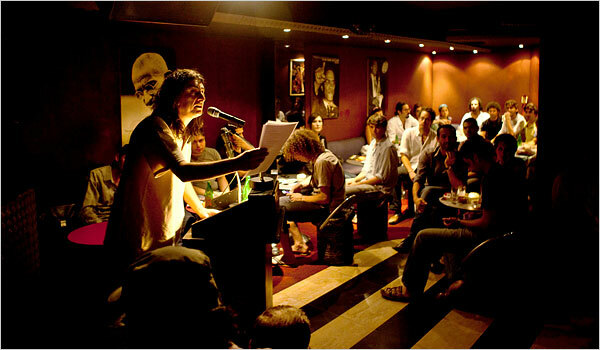 A few years ago, Mr. Derky had the idea for a poetry night. He found space in the underused bar of the Fardoss Tower hotel in downtown Damascus, which on other nights is a disco or just a dark watering hole. Though poetry is widely read throughout the Middle East, independent showcases like Bayt al-Qasid are increasingly hard to find, Sinan Antoon, an Iraqi poet and novelist who is an assistant professor of Arabic literature at New York University, said. At Bayt al-Qasid, the evening starts at 10 p.m., but people start arriving hours earlier. During an intermission, a parking lot behind the hotel is filled with smokers. Talk during the performances quickly invites angry glances from the other patrons. On another Monday last month, a young Iraqi poet, Hoshang Waziri, read a poem about God and Satan, another touchy subject. A patron, Sahban al-Sawah, sipped his arak and sang Bayt al-Qasid’s praises. “In a culture that loathes dialogue,” the evening represented something different, said Mr. Sawah, the editor of a poetry Web site. DAMASCUS // The rivalry between the United States and Iran for Syria’s affections appears to have stepped up a gear…..
That means the tug of war between Tehran and Washington over Syria remains firmly stacked against the US. For the past three decades, Syria has been closely tied with Iran, the alliance enduring ups and downs and seismic regional events. With both countries still facing a hostile West, neither has been given a persuasive incentive to change that status quo. The Credit and Monetary Council (CMC), which is affiliated to the Central Bank of Syria, reduced interest rates on various categories of deposits in August, according to an announcement published in mid-September. The latest move was made in a bid to stimulate investment without deterring saving in the national currency. The rate for time deposits was cut by 50 basis points to a range of 5.5-7.5% (plus or minus 2%), from a 6-8% range, which has been in force since January 2009. The rate on savings deposits was reduced by 50 basis points to 5.5% (plus or minus 2%). Banks must keep the gap between the highest and lowest rates that they provide for their customers at or below three percentage points, when dealing with time deposits. There is also a S£1m (US$21,730) limit on individual savings accounts. The bank felt that it had room to make the latest moves, given that there are no serious inflationary pressures. Although at the start of this year, the central bank announced that it would start producing a monthly inflation report, the only report to be issued so far was for February. The central bank has issued inflation data for April 2010 when the year-on-year increase in CPI was 5.6%. the euro has also been reflected in an increased preference for local currency savings. The Economist Intelligence Unit forecasts that the Central Bank of Syria will continue to implement monetary reform and gradually gain greater autonomy. It is likely to continue to reduce the restrictions on foreign-currency transactions, a process that it started in early 2008, in order to facilitate investment. Consumer price inflation is expected to rise in 2010-11, to an average of 6.3% over the period as a whole (from just 2.6% in 2009). However, this remains below the peak of 15.7% in 2008. BEIRUT, Sep 20, 2010 (Xinhua via COMTEX) — Lebanese Prime Minister Saad Hariri has informed members of the country’s parliament that he will not back down from supporting the Special Tribunal for Lebanon (STL) over the killing of his father, after such calls were made by the rival parties, an official said Monday. Although it is forbidden by law, corporal punishment of students still seems to be quite common at Syrian schools. if 2 syrian students read austen, more than number of u.s. students who did. memorizing, copying, cliff notes(?). pass a test. move on. dont think. is corporal punishment an inheritance from our former european, colonizing occupiers? looking back to pre college, knowing the answers to 20 questions way for students and schools to look good and get funding. George Mitchell presented Syria with partial withdrawal from Golan that will take 20 years, on condition that Syria stop supporting HA,and cut relations with Iran immidiately. (New York) – The Syrian government should immediately release Tal al-Mallohi, a 19-year-old high school student and blogger held incommunicado without charge for nine months, Human Rights Watch said today. She has been held by Syria’s security services since being detained on December 27, 2009. State Security (Branch 279), one of Syria’s multiple state security agencies, summoned al-Mallohi to Damascus for interrogation in December and immediately detained her. Two days later, members of State Security went to al-Mallohi’s house and confiscated her computer, some CDs, books, and other personal belongings. Since the arrest, the security services have not allowed her family to communicate with her and have not offered any explanation for the arrest. On September 1, al-Malouhi’s mother issued a public appeal to President Bashar al-Asad urging him to provide her with information about her daughter. What happened to Karfan. Also is Imad Mustafa a Sunni or Alawi? That George Mitchell offered Syria a partial return of the Golan that will TAKE 20 YEARS.. The Syrian government should IMMEDIATELY release Tal al-Mallohi, a 19-year-old high school student and blogger held incommunicado without charge for nine months, Human Rights Watch in New York said today. The logic of THE LEADING DEMOCRACY still rules in its relations with the Arab World. 20 yrs jews will have forgotten about the 2 cm they were partially returning. what did georgie, the jewish butler, present to israel. Yes in Amerika, we have taken all thinking out schools so we can raise more idiots than the ones we already have. No, Syria shouldn’t give anything to the US and I’m sure you’ve all noticed that being the friend of the US can hurt in more way than we could count. Those pesky Jews put a damper on everyone’s day. Especially for those who are anti-semitic like yourself. I just saw this and wanted to share this how bad it is in state of California. This is one of million things going wrong here. It is really sad that people use Syria Comment as their tool for spewing antI-Semitic filth. Creativity in medicine can be seen in the ability to think outside the box. The ability to find new surgical procedures or any medical breakthroughs are almost impossible without having a creative and innovative mind. Did we ever wonder why barely any work of Arabs living in the Middle-East gets published in renowned scientific or medical journals? People like Ahmad Zoweil only managed to be awarded the Noble Prize in Chemistry when he worked in the US. Magdi Yacoub, prominent Egyptian cardiologist/Surgeon was refused from Surgery school when he was in Egypt. Anecdotes say that he was told his fingers were too fat to be a surgeon. Farouk Al Baz, another prominent Egyptian American geologist said on TV that the Egyptian government offered him a position of a science teacher in a small city north of Egypt before he left to the US. Would any of these people be able to reach where they are right now if they stayed in their countries and received their doctorates from there? I highly doubt it. There is also this cultural issue with conformity, that everyone has to be the same in order to be accepted. There is a lack of emphasis on individualism, as it is seen in many ways as unacceptable and falsely attributed to be the antithesis of altruism, which we know is not true. Schools have to start promoting the idea that every student is unique in their own sense, and that it’s fine to be different. Only when our young feel they have the freedom to say or do things which others might not agree with, will they be able to be creative. Last but not least, corporeal punishment should be prohibited. Any teacher engaged in such acts ought to be suspended and if repeated, expelled and possibly charged with assaulting a minor. It’s utterly unacceptable to hit students thinking this will create better students. my experience with drs/dentists in syria: they are at the least the equal of american counterparts. but more honest, less greedy. what sets american medical, dental apart are the vast number of drugs and very expensive equipment. without these, to be ill on a deserted island, one is better off with a pro from syria. pesky is not word for jews occupying syrian land and homes; incursions into and bombing syria; assassinations in syria; murdering syrians. antisemites with diseased minds passing the disease from generation to generation. antisemites claiming semite past, present. antisemites terrified of truth: to be found out as fakes, thieves, liars, murderers. syrians, lebanese, jordanians, other expats of syria the greater and sikhs, et al, are successful in great part from their business skills (and pressure to succeed in a foreign land) learned in their culture. success in amurderka cant be separated from the size and great natural wealth with only the size having to do with the system which is theft. the system was set up to aggrandize the leaders. that others can benefit from theft is accidental or at least benefits the elite. HASSAN. Your condemning statement above requires specific references to be considered seriously. Syrian teacher brutally torturing elementary school students is only transferred to another department in the Ministry of Education after being exposed through a video on facebook. In addition, her salary was reduced 3% for 4 months. I don’t know whether to laugh or cry. The video I saw of corporal punishment was not exactly torture. I am old enough to have been hit in exactly the same way in 6th grade in my school in Vermont. The carpentry teacher had a wooden paddle that he used to smack us on the bottom when we misbehaved. I got whacked a number of times. It was no fun. I a glad the practice has ended in the US. I am also glad that Syrian authorities are taking steps to stop this. Attitudes to corporal punishment have changed dramatically in the US and World over the last generation. I agree with you completely about creativity in Medicine. I am afraid that this is not a standard case of corporeal punishment. If you watch the video carefully, the teacher actually had taken quite some time from class to prepare the heinous attack on the students. It was very systematic. The teacher had some of the students take their shoes and socks off, then had other students assist her by grabbing the feet of their fellow student so the teacher can hit the target accurately! In another case the teacher had a special instrument used by the other students to carry the feet of the victim in the air, an instrument that one would find and used in the basement of police and moukhabarat departments. Also, in one of the videos, you can clearly see one student was told to stand in front of the class door in order to block anyone from coming in. I am also afraid to say that the steps taken to stop this come very short of what is proper. The teacher was not sued, which would have been very proper in this case. In fact, the teacher was not even fired from the Ministry of Education, but only transferred to a different section. What kind of message does this send out? Dear Leoni, My mistake. I didn’t watch that video. I saw one of slapping hands with a board. What you describe is on a different level. Perhaps the teacher was not fired because there is no law against corporal punishment and because it is not uncommon? Do we know what the law and practice are? “Kids as young as 6 years old have been handcuffed and carted off to jail for school infractions that may or may not have occurred. So have moms with a car full of children (see, for example, http://www.youtube.com/watch?v=4AaSLERx0VM ). also hidden from much public knowledge in syria are the military boot camps for difficult-to-handl-kids. apparently in syria many kids lack a caring family environment. therefore the need for an every now and then shout-at followed by boxed ears and a at-night, caring militry beating.